Dean Marjorie Zatz, graduate students Craig Ennis, Portia Mira and Michelle Len, and Associate Dean Chris Kello pose after UC Merced's 2018 GradSlam!. First place winner Mira will represent UC Merced at the systemwide event on May 3. After a fierce round of competition during last week’s UC Merced GradSlam! finals, the third time was the charm for quantitative and systems biology (QSB) student Portia Mira, who emerged as the campus’s new champion. For her success, Mira earned a $5,000 grand prize and the honor of representing UC Merced at the systemwide GradSlam! contest on May 3 at LinkedIn headquarters in San Francisco. 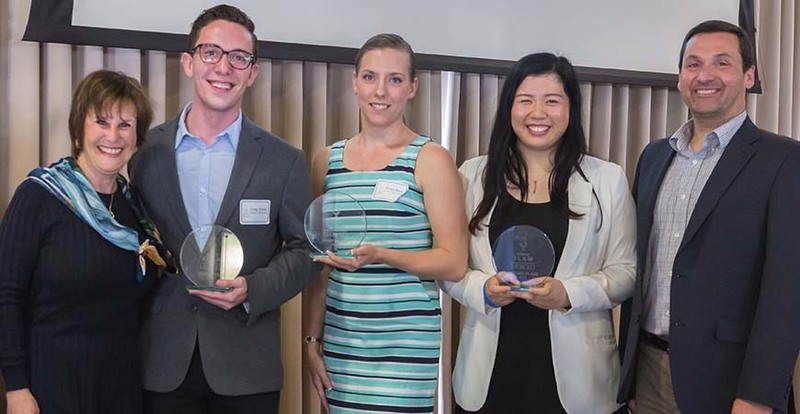 Runners-up were fourth-year mechanical engineering student Michelle Len, who placed second, and second-year QSB student Craig Ennis, who placed third. Mira’s research involves antibiotic resistance, a growing public and global health problem. Twice as many people die from antibiotic-resistant infections than HIV. If this trend continues, more people will die from antibiotic-resistant infections than from cancer by 2050. It’s also an expensive challenge, she said. The United States spends more than $20 billion annually in medical costs associated with antibiotic-resistant infections. “We can’t really depend on the development of new antibiotics because bacteria will just become resistant to them,” she said. That’s where her research comes in. Under the direction of advisor Miriam Barlow and co-advisor Juan Meza , Mira studies the effectiveness of antibiotic rotation. Hospitals rotate antibiotics over time, hoping to see resistance decrease. Mira’s research focuses on rotation within one class of antibiotics whose members are structurally similar. She developed mathematical models based on bacterial growth. Using the models, researchers identified 16 different resistant strains of E. coli that have a 60 to 100 percent probability of returning to an antibiotic-susceptible state. “What that really means is that we can use the antibiotics we already have to push the bacteria in reverse, making the infections they cause more treatable,” she said. GradSlam! is an annual contest in which participants give TED-talk presentations about their research. The goal is to make research more accessible by providing budding scholars with skills to present their work quickly and concisely to general audiences. Judges scored participants on how well they engaged the audience, how clearly they communicated key research concepts and how effectively they focused their presentations — all in three minutes or less. Mira almost didn’t sign up for this year’s competition, but she thought it would help her prepare for her thesis defense later this month. Plus, she’s married and raising three young children, ages 7, 2 and six months and plans to graduate on Mother’s Day. Mira, who graduated from Merced High School in 2006, said being a part of the nation’s newest research university has been phenomenal. In high school, she didn’t even know the difference between a community college and a four-year university. The UC systemwide competition on May 3 will be streamed live on campus at The Grad Pad for graduate students and QSB faculty. Campus community members can watch the event online .